I thought I'd be able to maintain a steady pace of posting something each Monday, but boy are your cycles FAST! I have to sync up so people won't think NSE has died! Last May, Dr. Em wrote a post about a few suggestions on combating stress. 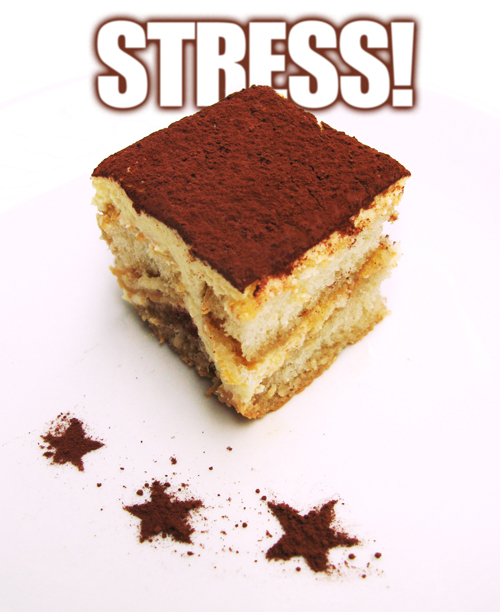 I threw in my usual way of dealing with stress, and it made me really hungry for Tiramisu (you'll see why in a while). Though it isn't my way to compare my hardships or lack thereof with other people, I always thought I had it pretty difficult as a medical intern (you know, no sleep, no pay, no respect). Of course, I was comparing myself to my peers who were already deep in the 9-to-5 groove. But reading about other people's lives, like Jack here who recounts his experience at a frozen food company, I realize that there's still some things I could never handle, and you can never really know how difficult someone's job is unless you walk a mile in their boots (or they describe it really frighteningly well, as Jack did). Not that I ever complained about how difficult my job was. I just say these things matter-of-factly. I always say, "As long as I'm not the person IN the bed, I don't have a right to complain." The ugly consequence, though, is there's always some people who'll say I have no right to appear stressed because my job isn't "as hard as theirs," and there are others who'll hate me because I don't appear as stressed as I "should be." Which is why I stopped caring about what people thought of me. I just do my job showing as little stress on my face as I can (they can go f*ck themselves for all I care). Here's a typical cycle in the most stressful (so most of us say) rotation: Obstetrics and Gynecology. 7:00-7:30AM Summary rounds. One hundred fifty students, residents, and consultants go over the cases that came in last night. Students in charge possibly humiliated. 7:30-5:30 or 6:00PM Outpatient department. Your team looks at 80 new patients and 80+ follow-up prenatal check-ups. For each patient, you handle the interview, with possibly a pelvic exam, pap smear, or pregnancy test. Possibility of being yelled at by the resident who checks your work. Sneak out one at a time to grab a quick lunch, but if you're lucky, you may get a true lunch break. Rest of the evening: Check out your patient at the wards, make progress notes and other paperwork. The rest of the night is yours. TEAM A (OB Admitting Section): Like an obstetric emergency room, you look at every woman who comes in labor, bleeding, etc. Draw blood, insert catheters, and send them where they need to be. TEAM B (Labor Room): You receive patients from the admitting section for anything that needs to be done. Cesarean sections, normal deliveries, and other things I won't mention here. Since you can't leave for both lunch or dinner, SOP is to have food delivered from McDonald's or such. Also, the patients you deliver become your patients till they leave. Study on their case because you'll be called on in tomorrow's summary rounds. TEAM C (Wards): You sit semi-permanently inside the wards and look over 30-50 patients. Each hour, you take the blood pressure, heart rate, and the fetus's heart rate of critical cases. Every four hours, you take the blood pressure and heart rate of everyone. The blood pressure machines aren't automated, so forearm muscles tend to get a bit sore. If someone flatlines, you call a code and get cracking. Lunch and dinner is inside the hospital cafeteria. 7:00-7:30AM Summary rounds. Prepare to talk in detail about the patients you encountered last night. Try not to be caught off-guard. Rest of the day: if one of your patients undergoes surgery, you assist (try not to pass out from lack of sleep). Otherwise, you do the paperwork of your patients. Worst case scenario is probably to go home at 2PM, best case is 8AM (YAY! Best feeling ever). Catch up on sleep. Now, I realize my schedule probably bored the living daylights out of everyone, but I needed to tell it so I could mention my favorite part of Day 3: Post-Duty Dinner. When I was an intern I ate dinner by myself, and as a self-reward for surviving another 3-day cycle, I ate dinner at La Piadina, a quaint Italian restaurant. I'd have the special for the day, which consisted of pasta for the day (if I'm lucky, it would be Spaghetti Aglio Olio), a piadina of my choice (chicken, sometimes tomato and basil), a grilled cheese sandwich of lightly battered sweet white bread with mozzarella, and an iced tea. In addition, I ordered the Tiramisu. Which I realize is so 1990's, but I don't care. They made the best, cheapest Tiramisu around, and as I savored each bitter-sweet morsel, it made the last three days fade away. Until tomorrow, when I repeat the cycle (for another 8 weeks). But at least I'd have dessert to look forward to! So, how do you reward yourself after a stressful day? There's two camps regarding the construction of Tiramisu: the cream side and the meringue side. The cream method is preferred by Giada diLaurentis and the Japanese. The meringue method is preferred by Mario Batali and "Uncle" Rob of the Curious Blogquat (I don't really call him Uncle, but he's pretty much monitored my progress in pastry from the beginning at the eGullet forums). I know I should probably defer to Batali, but I like the mouthfeel and appearance of cream. Also, it doesn't require additional sugar to be stable, and I find the mascarpone mixture plenty sweet as it is. Fortunately, I have yet another Italian-American to guide me in the cream method: Mary Ann at Finding La Dolce Vita. Since I do want you to visit their blogs, just click on the links above for the method. I used a half-recipe of Mary Ann's, to fill a 9"x9" Pyrex dish. Uncle Rob also wants to know if you can guess what this is. A prize awaits the first one to get it right. Clue is in the rules.